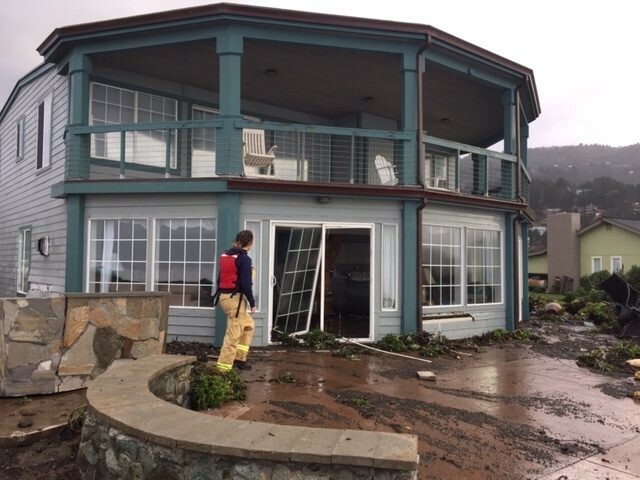 Damage caused to a Shelter Cove home. The Coast Guard (working without pay due to the government shutdown) this morning authorized the reopening of the Humboldt Bay harbor after heavy surf Thursday prompted the closure. But the rain is sticking around for a while, at least through Sunday, and the Eureka office of the National Weather Service has issued a flood watch beginning at 4 p.m. today through late Saturday for areas of Del Norte and northern Humboldt County. “Ponding of water on roadways, rapid rises on small streams, and mud and rock slides will be possible due to heavy rain,” the NWS Flood Watch states. Gusting winds up to 40 to 50 mph are in the forecast and those thunderstorms that made quite the appearance on Thursday are also expected to make another arrival on the coast Sunday. A frontal system is forecast to stall over the region today through Sunday. The front will server to focus moderate to heavy rainfall over Del Norte and northern Humboldt Counties Friday through Saturday night. Due to the long duration of the rainfall, a flood watch has been issued from 4 PM Friday through 4 AM Sunday. Lesser rainfall amounts will occur across the rest of northwest California. In addition, gusty south-southeast winds will develop this afternoon and evening over portions of interior Humboldt and Del Norte Counties above 1500 feet in elevation, where gusts from 40 to 50 mph will be possible. A colder airmass will enter the region Sunday afternoon, causing snow levels to fall to around 4000 feet. In addition, showers and thunderstorms may produce small hail along the coast Sunday afternoon and evening. For specific forecast details at your location, visit weather.gov/eka.